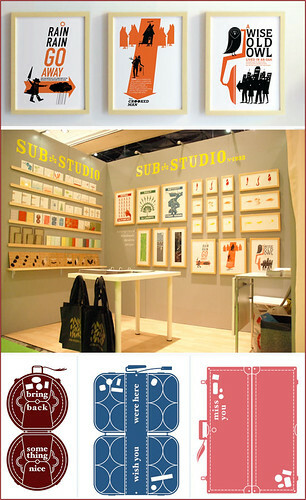 I had a lot of fun at the Stationery Show yesterday visiting my friend Anna of Sub-Studio. I’m a big Sub-Studio fan as you can see here and here, so it was great seeing all of their fabulous work in one booth. Of course the booth was designed impeccably and their work stood out amongst hundreds of others. If you have not checked out Sub-Studio or Brevity already, visit their shop and blog. *I have my eye on their travelogue set and nursery prints featured above.